Sock weather seems to be here to stay, doesn't it? I tried a bare foot with a pretty shoe the other day, and - not to be overly dramatic or anything - I thought my feet might perish of cold. Nope. Socks it is. It's a good day when I manage a matching pair of socks - as I write this, one foot is sporting a pale blue sock adorned with pink heart-shaped cherries, and the other is clothed in grey and yellow stripes. 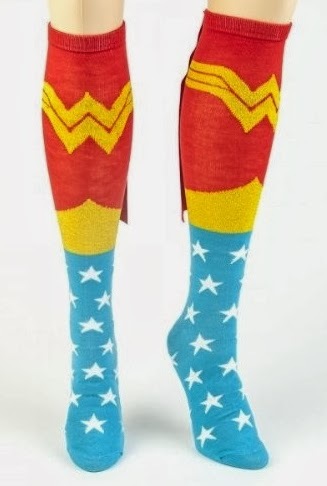 If I owned a pair of Wonder Woman socks, though, I'd make a bit more effort to master the art of sock-wearing. BECAUSE WOULDYA LOOK AT THEM?! They have little CAPES. It's quite possible (though not scientifically proven - yet) that you'd actually be able to FLY while wearing them. You might need to have your invisible plane on hand in case the socks malfunction, because with superpower comes super-responsibility. You wouldn't want to cause an accident. If you want these socks as badly as I do (you do, don't you? 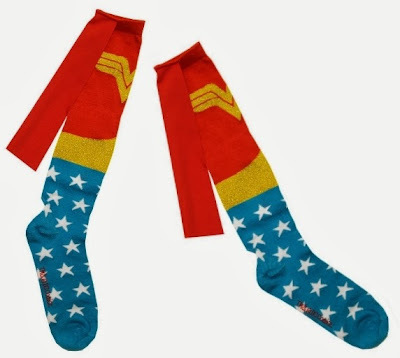 C'mon now - I'm waving my golden lasso around, so there's no point trying to lie to me), they're £12.99 on Amazon. Secret superhero style can be yours, through autumn, winter... and beyond. And if you're more of Superman, Batman or Robin type, well, there's a caped sock for you, too. Me? I'm holding out for She-Ra ones. Oh gosh, ouchy indeed, Claire! The postage was a much more reasonable price (like, um, £2!) when I wrote this! I think we Sluts may have wiped out the original stock and Amazon have perhaps replaced with a different supplier, because the price of the actual socks has also mysteriously gone down (not enough to justify a tenner in postage, mind)! I've had a look for another UK supplier, but alas, I can't find one. eBay is a great option - and I have spotted some on there - and hopefully postage won't be sky-high! Fingers crossed the Amazon listing reverts back to the original P&P price soon, though.